Several new super PACs have sprung up in recent months with the explicit aim of helping a particular lawmaker, including Sen. Orrin G. Hatch (R-Utah) and Rep. Howard L. Berman (D-Calif.). There are also super PACs that have formed to oppose the reelections of Sens. Scott Brown (R-Mass.) and Thomas R. Carper (D-Del.). 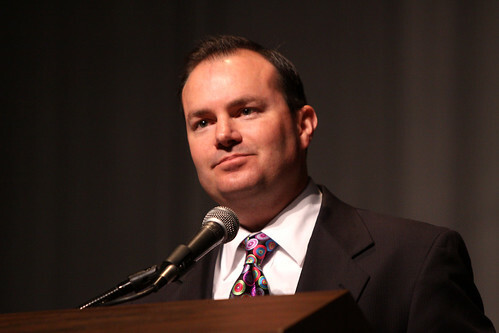 But the boldest proposal comes from Sen. Mike Lee (Utah), a freshman Republican who wants to add a super PAC component to his leadership PAC, the Constitutional Conservatives Fund. The Federal Election Commission is set to consider the request during a meeting Thursday. The idea would allow Lee to raise unlimited funds from corporations and wealthy individuals as head of the super PAC, then spend the funds to help other Republicans. It would mark another step toward unraveling campaign-finance restrictions that generally require outside groups to act independently of candidates. ...Even if the FEC rebuffs Lee, the mere existence of the proposal shows how rapidly the landscape has changed when it comes to regulating election spending. After a 2010 Supreme Court ruling allowed corporations to spend unlimited amounts of money on elections, candidates and political strategists have been pushing the legal envelope to see how far they can go in throwing out the old restrictions.